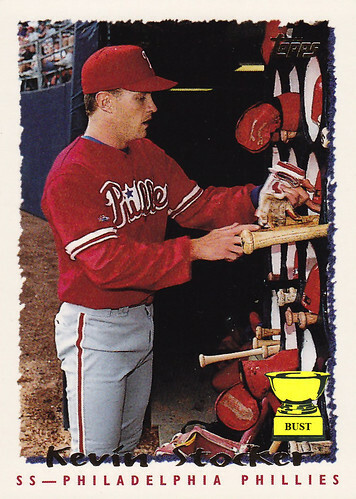 Kevin Stocker's train of thought upon seeing this card, 7:34 to 7:35 a.m. March 3, 1995: "You have to be kidding me. Oh, I get it. My last name is 'Stocker' so they show me stocking bats. Reeeaaalll clever. This is so amateur. They're making a mockery of my career. Hey, I'm the guy who hit .274 with two home runs last year. I don't know what other Phillies shortstop hit 11 doubles in 330 at-bats. I had at least three good plays in the field they could have shown. But, noooooo. They make a mockery of my name and my career with one photo selection. Well, maybe I should be glad my name isn't Kevin Stroker."